Amazon Echo is an AI personal assistant that will help you shop, manage smart home devices, and act as a DJ and news aggregator. And now it's got a new look, a cheaper price and slightly different controls - like with the Echo Dot, you now press buttons to turn the volume up and down compared with turning the top of the device on the old model. The chassis of the main old Amazon Echo, complete with its lovely volume-turning wheel, now forms the more expensive Echo Plus model. The design of the new Echo is clearly designed to better fit into a living space, with a choice of sandstone, charcoal or heather grey fabric finishes as well as premium oak, silver and walnut finishes which will cost you £10/$10 more. As we said in our original Amazon Echo review, Alexa feels like part of the family. But as with Google Home, the frustration of Echo comes from the gap between what I feel like it ought to be able to do, and the reality. To be fair to Amazon, it doesn't bill Echo as having amazing audio quality. If you want that, check out the Sonos One with Alexa. The much cheaper and smaller Echo Dot remains a good bet plugged into a decent speaker. It's not a massively high bar, but Echo is better than Google Home as a speaker. Where Echo has improved since version one is in terms of its feature set, which has grown continuously thanks to diligent support from Amazon and a growing arsenal of third-party apps or 'Skills' that let you do everything from ordering an Uber to receiving hypnotherapy. And there's also the significant price drop, too. Setup and fine control - such as configuring your user account, telling Echo where you live and pairing Echos together - is all done through the Alexa app for iOS and Android. This was a bit ropey to begin with, but has markedly improved. A little problem with this new Echo is actually its name. The new Echo Plus looks like the old Echo. This review is the new Echo that is completely new. We don't think Amazon really thought the naming of the devices through. The speaker we've reviewed here should probably have been called, say, Echo Compact, while the speaker that is now the Echo Plus should have been called Echo still, BECAUSE IT LOOKS THE SAME! We have had 'normal people' ask us what the differences are because they are confused. And no wonder, because we were at first, too. If you ever used Siri or, even better, a voice-controlled car/satnav interface? If you have, and approach Echo thinking it's like that – "Well, this probably won't even hear me, and it's going to be hugely frustrating" – you'll be impressed at just how good it is at hearing and responding to you. If, however, you think it's going to be like an AI from a sci-fi movie who you can just talk to like a human, and who will anticipate your needs, you are going to be sorely disappointed. Where Echo does continuously improve is in terms of its feature set, which has grown continuously thanks to diligent support from Amazon and a growing arsenal of third-party apps or 'Skills' that let you do everything from ordering an Uber to receiving hypnotherapy. However, you can buy an Echo and barely concern yourself with its apps and AI and futuristic cleverness. It's also a brilliant music and radio delivery device (although not a particularly amazing speaker) and by far the world's best kitchen timer. Just about everything you do with Echo is via voice. You ask Alexa things; she replies. You order Alexa to do things, thus: "Alexa, set a timer for 15 minutes/play Adele/ask the Guardian for today's headlines". She agrees verbally to do so, then gets on with it. If you have Amazon Music, then asking for music works seamlessly. If you have Spotify, you need to say "on Spotify" after every music request. Anything else? Just Bluetooth it, mate. Setup is incredibly easy. Just download the Android or iOS Alexa app, long press the mystery button to find your Wi-Fi and enter the password via the app. That's all it needs to be functional, although you should subsequently pair your Amazon, Spotify and Google calendar accounts, and choose your favourite news sources and sports team. Indeed, the Google Calendar integration is excellent and truly it is better than the implementation on Google Home, which is a bit weird isn't it? As a kitchen timer, Echo is unsurpassed. Hands full/covered in oil? Doesn't matter, just tell Alexa to set a timer. Want to know how long's left? Ask her. Need to set another timer for the peas? She'll start as many as you like, all with numbers by default, but with the option of adding names as well: "Alexa set a timer for pasta for 10 minutes." The alarm sound is pleasing but unmissable, and can be silenced with a simple, "Alexa, stop". Since a recent update you can also ask her for reminders. "Alexa remind me to pick up the dry cleaning at 3pm", that sort of thing. The pic above shows the blue lights that appear around the rim of Alexa's, er, 'face' when she hears her name called. The one below shows the circling blue-and-white lights that chase around it as she has a bit of a think about what you've just asked her. Has she understood you? Can she do it? The answer to those questions is not straightforward, unfortunately. Echo's voice recognition is better than Siri's or Google's, presumably because it has more and better mics, and possibly better software (we can't wait to see what HomePod is like though, as Siri is improving all the time). It can hear you from a distance, and also hear you over background TV or cooking sounds and even over the sound of loud music issuing from her own loudspeaker, although you sometimes will need to move closer and/or shout. Perhaps more importantly, because Echo is always there in the room, rather than being in your pocket, you just feel more inclined to talk to Alexa. She's always listening for her name, then starts listening 'properly' as soon as she hears it. Unless, of course, you're a conspiracy theorist, in which case she's listening to you all the time, spying on you. Yes, even when you're on the toilet. If you are such a person, I reckon give Echo a wide berth. What becomes apparent over time is that Alexa is not very consistent, and there are obvious limits to how she can understand you. This manifests itself in several ways. Most simply, she requires you to say "Alexa" at the start of every command. So you can't say "Alexa, skip this track" and then, "And this one" or "skip again". Many instructions, especially around smart home control require very specific wording. For instance if you have named your Philips Hue lights "front room" that is what you must call them. You can't use synonyms such as 'lounge'. If you're in the front room, logically, you should be able to just say, "Alexa, turn on the lights". But you can't. Dig deeper and you hit further frustrations. It used to be an absolute nightmare changing the colour of bulbs but Amazon, to its credit has fixed this. But while you can now say "Alexa make the front room blue", you can't ask it to "turn the front room blue" or "set the front room to blue". Alexa, how about some music? If you have Amazon Music, then asking for music works seamlessly. If you have Spotify, you need to say "on Spotify" after every music request. Anything else? Just Bluetooth it, mate. Coincidentally, you can now multi-room music through Echo via the Alexa app. You can ask for music by artist, playlist, album or song titles. You can skip tracks and change the volume. You can also tell Alexa you like a track - including on radio stations played through Echo - presumably making it more likely to appear again in the future, or that you hate it, so you need never be afflicted by Mumford and Sons again. You can also ask for Amazon 'stations' for artists, and get things that are a bit like what you originally asked for, sort of. The recommendations engine isn't amazing. Although searching for playlists, genres and artists is generally okay, you really start to run into problems if you want specific albums or tracks. Presumably that's because Alexa is searching a database of millions of titles, many of which sound similar if not identical. It can become incredibly frustrating repeating a track title like you're talking to an elderly relative, and if you want an album title that is also a song – most David Bowie albums from Aladdin Sane onwards, for instance – you will of course have to remember to say "play the album Station to Station". The thing is, it's not as if searching music manually via your phone is a Labour of Hercules. Alexa's struggles with parsing track titles is a real problem. I accept, however, that many users will be perfectly happy saying "Alexa, play 80s music" or "Play Adele" and won't be too bothered about the shortcomings with more specific requests. Music playback is also not the end of Alexa's aural talents. She can play music and news radio stations via TuneIn or RadioPlayer. You want more tailored news? Alexa can serve up news reports from audio sources such as Radio 4, BBC World Service, Sky, podcasts and audio reports from the Guardian, Economist and others. She can also robotically read out headlines and stories from The Guardian, Telegraph and Mail (all sociopolitical boxes ticked there, then). Although her cadence and slightly alien pronunciation make this something of a chore, it could be a godsend for anyone suffering from poor eyesight, illiteracy or an inability to multi-task reading a paper/phone screen and eating muesli. "I'm sorry, I don't understand the question." No, actually, Alexa and Echo can do a number of other things but I'd consider all of them, at present, to be side benefits to its audio, list-making and kitchen-timing attributes. First and, Amazon no doubt hopes, foremost, Amazon Prime members can now order shopping. Although in truth, most users will find it's only really handy for re-ordering things. Simply bark, "Order toilet paper/dishwasher tablets/Lego/Kalashnikov AK-47" and they'll all be delivered the very next day, apart from the last one. So ask for "dishwasher tablets" and it will suggest a pack of 90 Finish tablets, or 70 Fairy Platinum. If you want any other brand or quantity, you'll have to go online as usual. Voice purchases are protected by a PIN, set in the app. Where Alexa is more useful, in theory, is re-ordering products, as that removes the problem of too much choice. Anything Prime-eligible that you've ordered from Amazon online or via Alexa can be re-ordered with a command. Further exciting Alexa action comes in the form of yet another way to turn on your Hue bulbs, as well as Hive and Nest's respective suites of compatible smart gizmos, and the more obscure likes of Kasa and Belkin. For basic control, this is quite handy. You'll need to give every smart bulb, smart plug and smart whatever else its own name – and then, more to the point, remember it. That's why I don't see this supplanting smartphone control any time soon, but for basic lights on/lights off, turn the heating up/turn the heating off type actions it's good. The Echo can also bolt on new abilities by activating "Skills" (apps, essentially) from the Alexa app. These veer wildly from the fairly useful - ordering an Uber to your home, re-ordering meals you've previously had from Just Eat, getting someone to come pick up your laundry - to the perhaps slightly more questionable ("Alexa, toss a coin", "Alexa, what is House Baratheon? ", "Alexa, tell me today's yoga position"). That's because Alexa's 'Skills' are really 'apps', from an 'app store'. And as we know, in any app store on a new platform, to get to the merest morsel of wheat, one must have many cubic feet of one-star-rated chaff forced down one's gullet. It'll get better, no doubt. Echo is one of those devices that anyone can use - well, almost anyone, you know what we mean. Alexa can and will be a fantastic assistant to the elderly and people with certain disabilities. I'm not sure why Amazon doesn't play this up more as it is really, really important. Today's children, too, will grow up using voice control naturally. If you think there's something unfortunate about that, then we're afraid you're basically King Canute. A future version of this device will be able to run your home. Weather about to get bad? It will know and adjust your home's temperature accordingly without you having to ever set up a rule or spend ages configuring it. 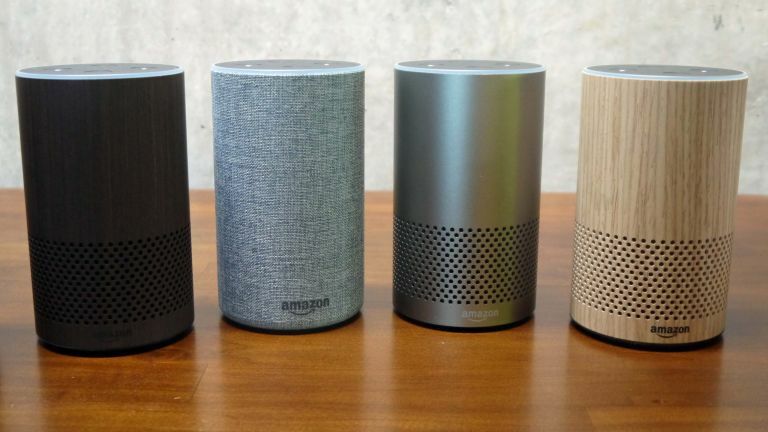 It must be said that there is a downside to this - with Echo, you are, in effect, inviting a Trojan horse for Amazon's shops and media stores into your home, to listen to you, and then sell you more stuff. Of the big players, only Apple has pointedly said that it doesn't want its personal assistant to collect personal information about you for other purposes. At the moment, Echo is a fantastic kitchen timer that's also a proficient music player and a way receiving, in audio form, real-time info - news, weather, sport, shopping, traffic - that you would normally get via your mobile, laptop or TV. It isn't the best for audio quality and we're sad that many will buy it thinking that it is. But it's a relatively cheap device and you do get what you pay for; that isn't actually Amazon's fault. We still think that if you have an existing, quality, audio system in your kitchen or living room that you should plump for the cheaper Echo Dot. Like this device, it's also brilliant value for money.